In stock -This product will ship today if ordered within the next 2 hours and 43 minutes. ParaGONE is a 15 day broad spectrum antiparasitic, antimicrobial and antifungal herbal cleansing programme. It contains herbs and extracts that are widely used to remove both visual (nematode) and microscopic (bacterial) parasites from the body. It also contains antifungal herbs and extracts that are known to eliminate yeast/fungal organisms from the body. Antiparasitic herbs rid the body of parasites in two different ways. One group of herbs works by paralyzing the organism directly, allowing the body to remove it through the regular channels of elimination. Another group of herbs works by directly destroying the organism. 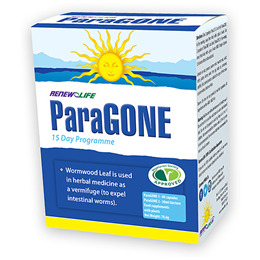 ParaGONE is a formulation for cleansing parasites from the body, but it is also powerful enough to eliminate yeast (candida), as candida often co-exists with parasites. Renew Life`s mission is to empower customers with the knowledge to improve their overall health through optimum digestive function and superior nutrition. Wormwood Leaf Extract (Artemisia absinthium), Caprylic Acid Powder (Magnesium caprylate), Garlic Bulb Extract (Allium sativum), Thyme Leaf Extract (Thymus vulgaris), Vegetable Capsule Shell (hydroxypropylmethylcellulose, water), Black Walnut Hull Powder (Juglans nigra), Clove Bud Powder (Syzygium aromaticum), Pippli Seed Powder (Piper longum), Quassia Wood Extract (Picrasma excelsa). Carrier: Filtered Water, Carrier: Ethyl Alcohol, Black Walnut Hulls (Juglans nigra), Clove Bud (Syzygium aromaticum), Marshmallow Root (Althaea officinalis), Orange Peel (Citrus sinensis), Wormwood Leaf (Artemisia abisinthium). Take 2 capsules of ParaGONE 1 and 1ml of ParaGONE 2 in the morning, away from food, with a glass of water. Take 2 capsules of ParaGONE 1 and 1ml of ParaGONE 2 in the evening, away from food, with a glass of water. NOTE: ParaGONE 2 dropper dispenses 0.5ml when filled to line indicated. Store in a dry place away from direct sunlight and heat. Do not exceed recommended daily dose. Not recommended for children under 12. Prolonged use is not recommended. Do not use if pregnant or lactating. Below are reviews of Renew Life ParaGONE 1 & 2 - 15 Day Programme by bodykind customers. If you have tried this product we'd love to hear what you think so please leave a review. I bought this product to get rid of nasty parasites. Toward the end of the treatment, I started having a yeast infection. This product does kill parasites and bacteria, but also the gut intestinal flora. Will not be taking it again. I don't feel it is fair to rate this product as I have no way of knowing whether or not it has worked. It is not very pleasant to take and it is difficult to time it as it has to be taken at least an hour away from meals. I don't feel any different digestion wise??? I'm so happy with this product. I have suffered with digestive problems for years and more severely since a bad case of food poisoning whilst travelling in Asia nearly 10 years ago. After the food poisoning/infection I also developed chronic fatigue and although my health has improved a lot over the years, I still have food sensitivities, gas, bloating and other digestive problems. At first taking ParaGone I didn't notice anything but on day 4 I felt pretty nauseous and sick. I then got constipated and by day 7 felt quite hot and really tired, like my body was detoxing. Two days later I woke up needing the toilet and when I emptied my bowels discovered that worms had been released! I've released more since and am only on day 10. I'll definitely continue using ParaGone for the full treatment and feel confident about trying other Renew Life products now too. Everyone should try this stuff. I've found out I'm host to all sorts of things I'd rather not be. I'm not sure it's up to the full job of eliminating the problem completely - but within 4 days at least I had a handle on what was making me so dog tired. More research on the subject has led me to the conclusion that the two boxes they recommend, 35 days, is nowhere near enough - but this is a cost effective way to test the water to see if parasites are a problem for you.